This chapter turns to the third repercussion of Occupy Central on public universities by examining the rapid rise of pro-independence voices in Hong Kong society and university campuses after the occupation, and how local and central authorities and universities responded to students’ advocacy and promotion thereof. 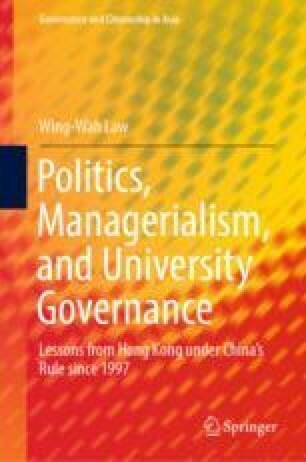 The chapter shows that, after the failure of Occupy Central, a number of Hong Kong people, particularly young people (including university students and graduates), shifted their political goal to attaining either Hong Kong’s self-determination within, or political independence from, CPC-led China. At the societal level, pro-independence localist youth political groups use different strategies and tactics to attain their new political goal, while pro-independence students conceptualized and promoted campus activities advocating Hong Kong independence. University heads, bowing to government pressure, warned students against the display and spread of independence messages on campus. One HKU academic who was an Occupy Central cofounder continued exploring China’s political future, including the possibility of Hong Kong independence, subjecting himself to official condemnation and severe political attacks by pro-establishment forces and media. Dan, R. (2018, January 25). Sahoshu Xianggang Daxuesheng De Shiye Tai Zhaile [A small number of Hong Kong University students have a narrow horizon]. Huanqiu Shibao [Global Times]. Retrieved from http://opinion.huanqiu.com/shanrenping/2018-01/11552378.html. Demosisto. (2018). Our manifesto. Retrieved from https://www.demosisto.hk. Education Bureau. (2018, February 7). LCQ21: The use of Putonghua as the Medium of Instruction for Teaching the Chinese Language Subject in Primary and Secondary Schools. Retrieved from http://www.info.gov.hk/gia/general/201802/07/P2018020700609.htm. Education University of Hong Kong Students’ Union. (2017). Youguan Xiaonei Minzhuqiang Ji Xueshenghui Fanwei Nei Suo Xuangua De Henge [A public letter to University President concerning the banners on the democracy wall within the jurisdiction of the students’ union]. Retrieved from https://touch.facebook.com/story.php?story_fbid=1604161752983202&id=316480888417968. Heads of Universities. (2017, September 15). Statement (Concerning freedom of expression and Hong Kong independence). Retrieved from http://www.hku.hk/press/press-releases/detail/16811.html. HKUST Cantonese. (2016, March 24). Teaching Chinese communication courses with Cantonese as the medium of instruction and the launch of a referendum on this issue. Retrieved from https://www.facebook.com/HKUSTCantonese/posts/840059589438458. Hong Kong Alliance in Support of Patriotic Democratic Movements of China. (2017). About Hong Kong alliance. Retrieved from https://hka8964.wordpress.com/hkaeng/#eng_who. Hong Kong Baptist University Students’ Union. (2018). Jiu Zhanling Yuwen Zhongxin Zhi Chengqing [Clarification on occupying the language center]. Retrieved from https://www.facebook.com/HKBUSUpage/posts/950703431746155. Hong Kong Government. (2016, February 29). Legislative Council new territories east geographical constituency by-election results. Retrieved from http://www.info.gov.hk/gia/general/201602/29/P201602290121.htm. Hong Kong Government. (2017, September 8). CE condemns improper remarks appearing on university campuses. Retrieved from http://www.info.gov.hk/gia/general/201709/08/P2017090800644.htm. Hong Kong Government. (2018b, March 30). Response by HKSAR Government to media enquiries. Retrieved from http://www.info.gov.hk/gia/general/201803/30/P2018033000690.htm. Hong Kong National Party. (2018, April 9). Xianggang Xuyao Zhongguo Nai Diguo De Siwei [Hong Kong needs ‘China is the Enemy’ thinking]. Retrieved from https://www.facebook.com/hknationalparty/posts/800782256787397. Lam, C. (2018, April 6). Xingzheng Zhangguan Huijian Chuanmei Tanhua Quanwen [Transcript of remarks by CE at media session]. Retrieved from http://www.info.gov.hk/gia/general/201804/06/P2018040600558.htm. Leung, C. (2016, February 23). ‘No Bottom Line’: New Chinese University student leaders say they will resort to violence if majority want it. South China Morning Post. Retrieved from http://www.scmp.com/news/hong-kong/politics/article/1915206/no-bottom-line-new-chinese-university-student-leaders-say. Leung, E. (2016b). Speech on the first pro-independence rally (7 August). Retrieved from https://www.facebook.com/pg/hkindigenous/videos/?ref=page_internal. Liu, W.-L. (2018). Xiang Dang, Guojia, Renmin He Yuwen Zhongxin Touxiang: Wo De Yifeng Huiguo Shu [Surrendering to the party, the nation, the people, and the language centre: My confession]. Retrieved from https://www.facebook.com/photo.php?fbid=10216796695457477. Ming Pao Editor. (2014, January 3). Jiduan Zuzhi Chengshi Buzu Baishi Youyu Weifa Xingwei Ying Chengchu [Extremist groups bring forth more damage than accomplishment and illegal behaviors should be punished]. Ming Pao [Ming Pao News]. Retrieved from http://news.mingpao.com/20140103/mra.htm. Ming Pao Reporter. (2017, September 6). Zhongda Zaixian Gangdu Biaoyu [Reappearance of Hong Kong Independence Slogans in Chinese University of Hong Kong]. Ming Pao [Ming Pao News]. Retrieved from https://news.mingpao.com/pns/dailynews/web_tc/article/20170906/s00002/1504634309581. Societas Linguistica Hongkongensis. (2018). Shiming Zuzhi Zongzhi [Mission and purpose]. Retrieved from https://zh-hk.facebook.com/hongkonglangstudies/. Student Unions of Higher Institutions. (2017, September 10). Arming ourselves in our darkest hour: Declaration on the controversy surrounding democracy wall. Retrieved from https://www.facebook.com/CUHK.SU/posts/1584780091584394. Studentlocalism. (2016). About studentlocalism. Retrieved from https://www.facebook.com/studentlocalism. Students’ Unions of Higher Institutions. (2017, September 16). Response from students’ unions of higher institutions towards the joint statement by Heads of Universities. Retrieved from https://www.facebook.com/hkusupage/photos/a.512349045490265.1073741833.509449175780252/1506480776077082. Tai, Y. T. (2017, December 9). Zhongguo De Weilai … Xianggang De Weilai [China’s Future … Hong Kong’s Future]. Xinbao [Hong Kong Economic Journal]. Retrieved from http://forum.hkej.com/node/147248-%E4%B8%AD%E5%9C%8B%E7%9A%84%E6%9C%AA%E4%BE%86%E2%80%A6%E9%A6%99%E6%B8%AF%E7%9A%84%E6%9C%AA%E4%BE%86. Tai, Y. T. (2018a, April 5). Du Xianggang Te[qu] Zhengfu De Yanzheng Yaoqiu [Serious request to the HKSAR Government]. Retrieved from https://www.facebook.com/BennyTaiHK/posts/853169024876860. Tai, Y. T. (2018b, May 24). Zai Lifahu 5 Yue 24 Ri Xiuhui Bianlun Zhong De Chenshu [Statement in the Legislative Council adjournment debate on 24 May (Read by Hon. Shiu Ka-chun]. Retrieved from https://www.facebook.com/BennyTaiHK/posts/873965969463832. Taiwan Youth Anti-Communist Corps. (2018). Taiwan Qingnian Fangong Jiuguotuan Shi Zhounian Jinian Huodong [The 10th anniversary of the Taiwan Youth Anti-communist National Salvation Corps—A forum on freedom and human rights in Hong Kong, Macao, China, Taiwan and Multi-ethnic Groups, 24 March]. Retrieved from https://www.youtube.com/watch?v=RlyaDBPT_Dc. Undergrad. (2015, February). Zhengzhi Yu Kangzheng 2015 Minyi Diaochai Jieguo [Results of survey on the ‘Politics and Resistance’, 2015]. Undergrad, 5–7. Retrieved from https://www.undergrad.hk/517. Xinhua News Agency. (2018a, March 31). Guowuyuan Gangaoban: Jianjue Zhichi Xianggan Tebie Xingzhengqu Zhengfu Yifa Guiguan Gangdu Fenzi Yu Waibu Fenlie Shili De Goulian Huodong [The Hong Kong and Macao affairs office of the state council: Firmly supports the Hong Kong Special Administrative Region government’s efforts to regulate the activities of “Hong Kong independence” activists and external separatist forces in accordance with law]. Retrieved from http://www.hmo.gov.cn/xwzx/zwyw/201803/t20180331_17668.html. Xinhua News Agency. (2018b, March 31). Xianggang Zhonglianban Fuzeren Jiu Daiyaoting Fabaio Gangdu Yanlun Biaoshi Jida Fenkai He Qianglie Qianze [Leader of Hong Kong Liaison Office expresses great indignation and strong condemnation of Tai Yiu-ting’s speech on “Hong Kong independence”]. Retrieved from http://www.locpg.hk/jsdt/2018-03/31/c_129841729.htm. Youngspiration. (2015a, May 18). Bentu Yu Xianggang Ren [Localism and Hong Kong people]. Retrieved from https://zh-hk.facebook.com/youngspiration/posts/813508698740767:0. Youngspiration. (2015b, March 29). Qingnian Xinzheng Chengli Yihui Gexin Sanbuqu [Founding of youngspiration, three steps to reform the legislature]. Retrieved from https://www.facebook.com/youngspiration/posts/788586857899618.